I hope you all had a lovely Christmas and that you will have a great 2014. One of my resolutions is to be more organised in the coming year. With that in mind when I was asked to join the Design Team at a new challenge blog called the Christmas Fun Challenge Blog I was delighted. 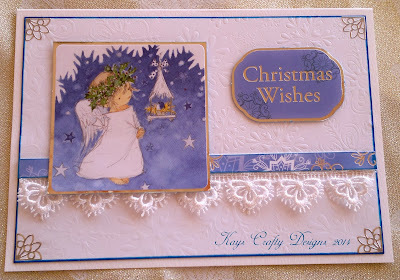 Below is my card for the 'Anything Goes' theme for January. I hope that you will join in. We have a great Design Team and there will be lots of ideas. So I challenge you to get crafting for next Christmas. It is quite a simple card. I scored an A4 card in half and cut an embossed piece of card for the background. I edged it with a matching promarker to make it stand out. I added lace and a piece of patterned card (I had no matching ribbon). The topper is from Lilli of the Valley and the sentiment from my stash. They are matted and layered on to silver mirri card and I added silver corner peel offs to bring balance to the overall card. I hope you like it. This is a beautiful Christmas design. Love the the lace trimming. Wishing you all the best that 2014 has to offer. Oh this is beautiful! The white and that blue together is very classy. The image is adorable and sweet.